You will exit this site and return to it once your transaction is complete. • Tax deductible contributions from individual members up to $3000 yearly. Your accountant or tax professional can advise. • Proceeds from sales of Alcoholics Anonymous World Services and Grapevine literature and other related A.A. material. • Special events by and for A.A. members, keeping in mind our Seventh Tradition. • Make a monetary contribution via check or money order, payable to Central Office of Albuquerque. 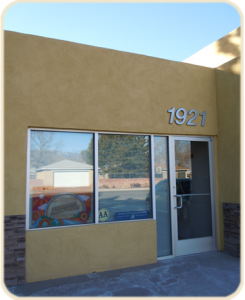 Mail or drop off in person at 1921 Alvarado Drive, NE Albuquerque, NM 87110. • Become a “Faithful Fiver” or “Trusted Tenner” and contribute either $5 or $10 monthly. Set up Auto Pay or Bill Pay with your bank to automatically send us a monthly contribution in any amount you choose. What could be easier? • Contribute with a secure credit card transaction, either at Central Office or by clicking the Contribute button.